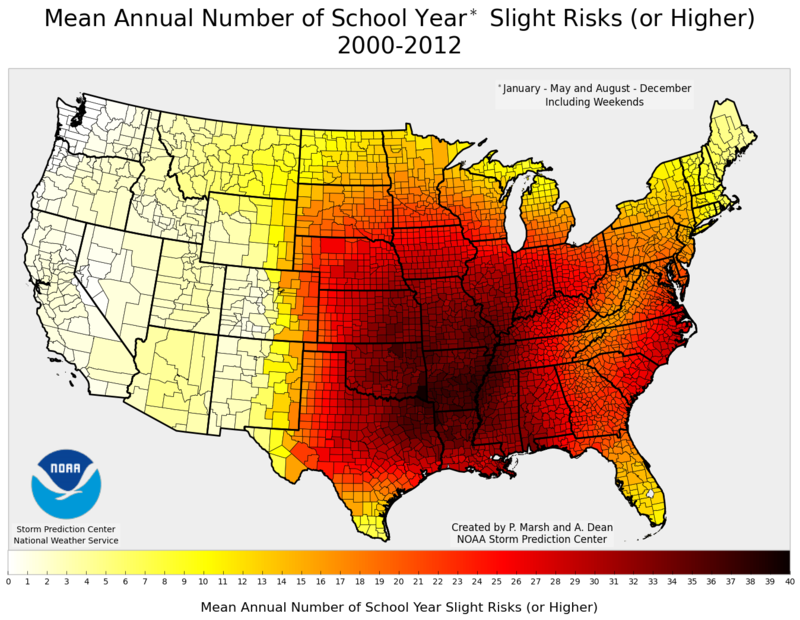 A couple of days ago I wrote about the Oklahoma School Year and Severe Weather. I had several requests to expand that analysis to additional areas. This is a fairly trivial task for determining the mean annual number of NOAA Storm Prediction Center Slight/Moderate/High Risks during the "Traditional School Year" as these products are valid for "days". (Note: I define the "Traditional School Year" as being from 01 August - 31 May, inclusive. This means weekends and holidays are included.) It is much more difficult dealing with the watches as this is dependent upon things such as time zones, which makes preprocessing the data a bit more difficult. As such, this post addresses half of the request I had received: the NOAA Storm Prediction Center's Severe Weather Outlooks per county during the "traditional" school year using data from 2000 through the end of 2012. Below is the mean number of slight risk (or higher) outlooks for the traditional school year. As you can see, most areas east of the Rocky Mountains experience at least 1 slight risk (or higher) per school year. The maximum (nearly 37 days) is in southeast Oklahoma, and the centroid appearing to be in north-central Arkansas. 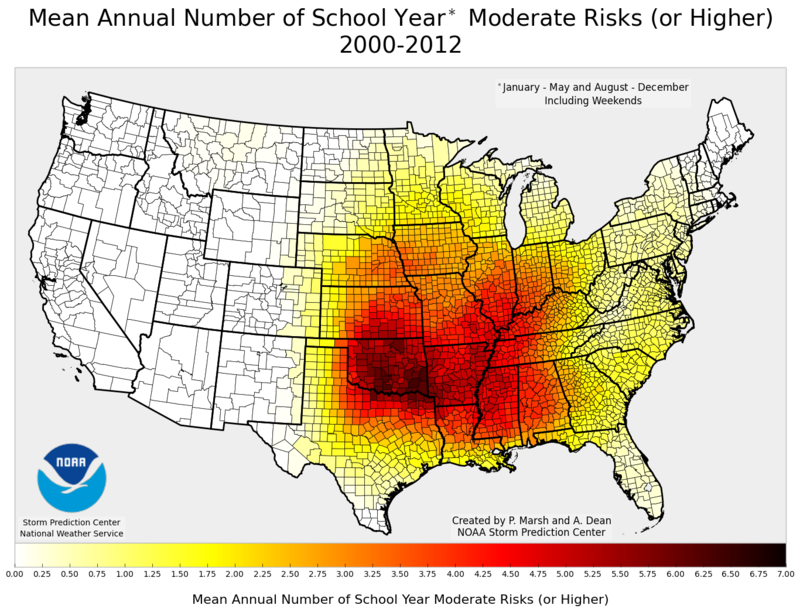 Below is the mean number of moderate risk (or higher) outlooks for the traditional school year. As you can see, once again, most areas east of the Rocky Mountains experience at least 1 moderate risk (or higher) per school year. The maximum (nearly 7 days) is located across much of Oklahoma, and the centroid appears to once again be located in the vicinity of Arkansas. 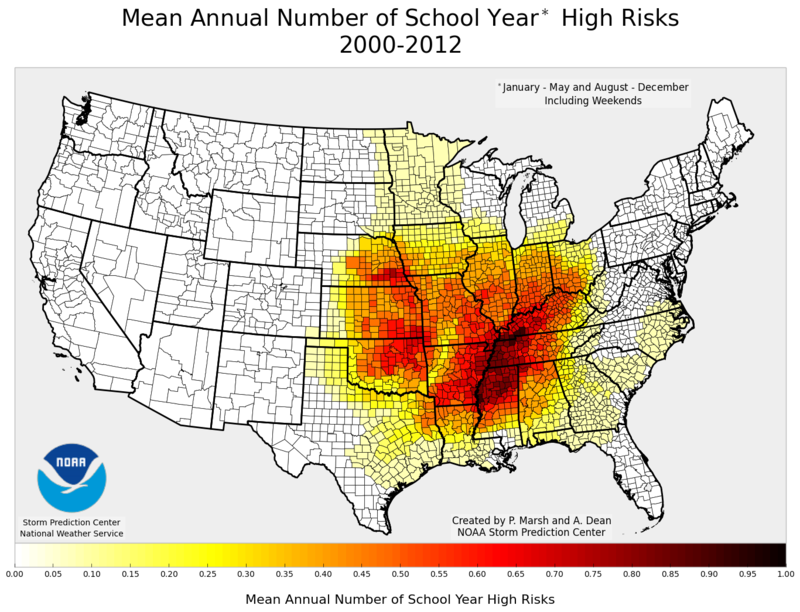 Below is the mean number of high risk outlooks for the traditional school year. Here, there appears to be two separate areas of high risk occurrences: one over the plains, and another in the Mississippi Valley. In fact, there is a relative minimum in occurrence across western Arkansas that serves as some sort of delineation between these two regimes. No area experiences at least 1 high risk day (on average), but the maximum (which is nearly 1) is located from northern Mississippi into southwestern Kentucky. The maximum in the plains appears to be located from northern Oklahoma [mainly the northeastern portion] northward into extreme southeastern Nebraska.